William Balch fired a probe into the Gulf of Maine while aboard the Nova Star. 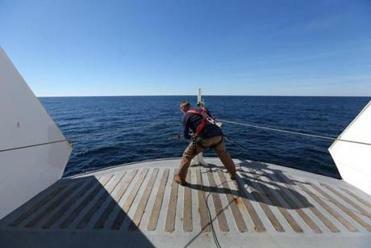 ABOARD THE NOVA STAR — At 12:31 p.m., just as a NASA satellite was streaking across the cloudless sky overhead, William Balch aimed an instrument that looked like a gun over the starboard side of the well-appointed Nova Star, a 500-foot cruise ship. “Ready to launch,” a colleague radioed from a mobile lab deep within the fast-moving ship. Balch fired the instrument and a probe plunged deep into the cobalt waters of the Gulf of Maine, verifying data gathered from the satellite and helping explain why the gulf appears to be warming faster than almost any other large body of saltwater in the world. Balch and his team have now sailed between Portland and Yarmouth, Nova Scotia, 176 times over the past 17 years, collecting the same set of data every time across the 200-mile voyage. The luxurious Nova Star, loaded with a spa, casino, and bars, is also home to a team studying climate change on the Gulf of Maine. For years, Balch’s team has braved stormy seas on much smaller, less-accommodating boats, often in winter. 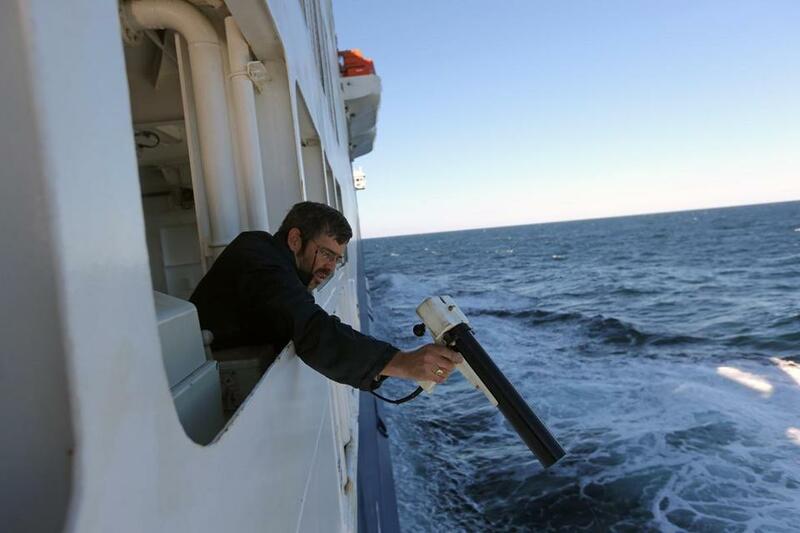 The 58-year-old oceanographer, who still packs nausea medication on every trip, has conducted research on vessels that have rolled a stomach-churning 45 degrees and on seas so high that waves have splashed over the bridge. The relatively luxurious Nova Star, with a spa and art gallery, four fully stocked bars, and a casino filled with 70 slot machines, has provided a more pleasant, if incongruous, platform for the team to work. “It helps to be on a ship with stabilizers,” said Balch, whose team works on smaller boats when the ferry suspends service in the colder months. But as they install strange sensors to the bow, extend long wires through the vehicle deck, and move about the ship wearing NASA shirts, the scientists sometimes draw quizzical stares and questions from passengers about their actions. The ship’s crew lets them go where they want and tries to stay out of their way, said Sverra Sovesnes, captain of the Nova Star. He said he doesn’t worry about the scientists disturbing the passengers, most of whom spend the 10-hour voyage sampling offerings at the martini bar or scanning the horizon for whales. “I haven’t heard of anyone asking if they’re looking for UFOs,” Sovesnes said. Balch’s team has worked on previous ferries that plied the waters between Portland and Yarmouth, including the CAT and the Scotia Prince. But those went out of business, and Balch worries the Nova Star could soon suffer the same fate. 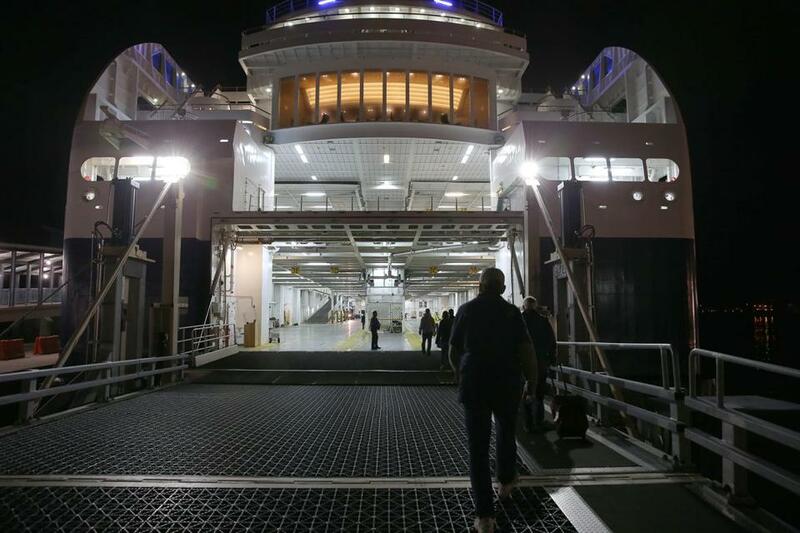 Last year, in its first season, 59,000 passengers sailed on the Nova Star; this year, the company estimates it will ferry only about 50,000 passengers — significantly fewer than the 80,000 they were hoping for, said Heidi Boie, a spokeswoman for Nova Star. The company blames the weakened Canadian dollar, as the number of Canadian passengers this year dropped by 40 percent. “The numbers could have been better, for sure,” said Boie, adding that the company will know soon whether it will continue service next year. Balch said his team will cruise the same route — measuring the ocean’s salinity, color, chemical properties, and more — so long as they receive their $250,000 in federal funding. Scientists boarded the ship to start their sea research. Other scientists say the long-term nature of Balch’s work, and his team repeating the same studies, has added crucial data to understanding the effect of climate change in the region. The researchers, for example, have measured a fivefold decline in the growth rate of phytoplankton, which indicates lower levels of the critical plants at the bottom of the marine food chain. Because phytoplankton are food for fish larvae, a lower abundance of the microscopic plants could mean lower numbers of adult fish populations years from now, Balch said. His team has linked the decline in phytoplankton to a surge of freshwater runoff from 22 river basins that feed into the gulf. Balch said increasingly heavy precipitation, which climate models suggest New England will face in the coming years, has already led to a 30 percent increase in the amount of organic carbon in the gulf over the past 84 years. They predict the amount of carbon in the water — which absorbs light that would otherwise allow phytoplankton to bloom — will increase another 30 percent over the next 50 years, potentially causing dire problems for the marine food web. “This knowledge is especially important in light of the rapid warming we’ve observed in this region,” said Andrew J. Pershing, chief scientific officer at the Gulf of Maine Research Institute in Portland. Recent studies have found that the gulf is warming faster than 99 percent of the world’s large bodies of saltwater. In their cramped lab on the Nova Star, Balch’s team has equipment that takes samples of the gulf 16 times a second and computers that analyze tiny particles in the water. A new instrument they brought onboard this month used a powerful laser to analyze the gulf. As the team monitored the orbiting satellites and calibrated their equipment to ensure they were filtering the water properly, Amy Wyeth braced herself: Even a ship as big as the Nova Star rolls in 9-foot seas.